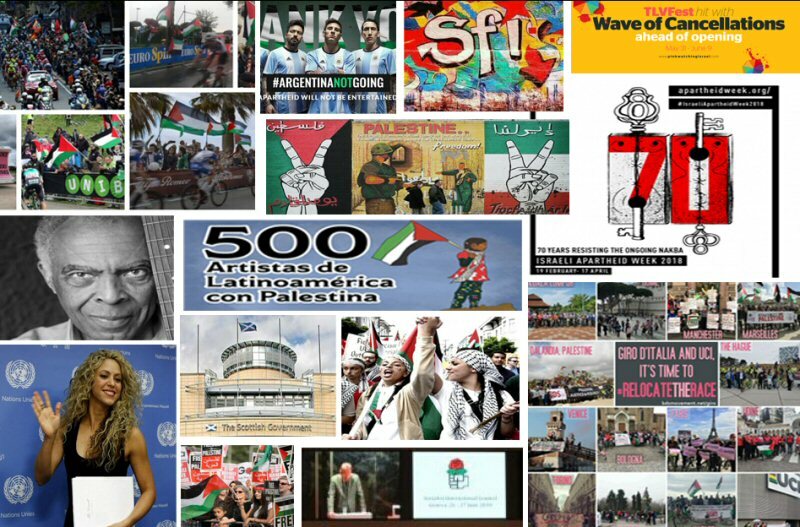 Here are 70 highlights of solidarity and BDS for Palestine in 2018. We highlight 70 moments of hope on this year marking the seventieth anniversary of the ongoing Nakba, or “Catastrophe,” wherein indigenous Palestinians faced mass expulsion from their homes to establish a Jewish-majority settler-colonial state. Many of the responses below followed Israel’s massacre of 60 Palestinians in Gaza on May 14, 2018, as the world watched Israeli snipers gun down Palestinian demonstrators simply for asserting their right as refugees to return home and to live in freedom. Amidst this tragedy and ongoing Israeli repression, we take great heart in the fact that calls to stop arming Israel and to hold it accountable for its crimes are growing stronger in the grassroots and also entering the mainstream. Governments, city councils, Members of Parliament and political parties in several countries work to impose a military embargo on Israel, as was done against apartheid South Africa. Others seek to revise or stop arms sales and training with the Israeli military. Socialist International, an association of 140 global political parties, including 35 parties in government, adopts BDS and calls for a military embargo on Israel until it ends its violations of Palestinian rights and apartheid system. The UK’s Labour Party leader Jeremy Corbyn reiterates his party’s commitment to “review the sale of arms [to Israel] that could be used in violation of international law,” while other Members of Parliament, such as Andy Slaughter and Caroline Lucas, explicitly call on the UK government to #StopArmingIsrael. In the Spanish State, the progressive party Podemos demands a military embargo on Israel, while one of Brazil’s fastest growing leftist parties PSOL calls for suspending all military and diplomatic relations. Belgium, Ireland and Luxembourg summon Israel’s respective ambassadors after Israel’s May 14 massacre in Gaza. South Africa and Turkey call their ambassadors to Israel for consultations, and Turkey asks the Israeli ambassador in Ankara to leave. The Scottish Green Party releases an excellent educational video explaining why BDS is needed now. Norway gives a “green light” to boycotts of Israel’s illegal settlements built on stolen Palestinian land. California Democrats vote to endorse an important bill that would prevent US tax dollars from supporting the Israeli military’s ongoing detention and mistreatment of Palestinian children. They also voted to oppose bills that seek to silence supporters of the BDS movement for Palestinian rights. Dublin becomes the first European capital to endorse BDS for Palestinian rightsand to call for dropping Hewlett Packard (HP) companies for their complicity in Israeli apartheid. Durham, North Carolina becomes the first US city to ban its police department from participating in international exchanges with the Israeli military or police. In a unanimous vote, Durham’s City Council banned police exchanges with any international agencies that would give Durham officers “military-style training” contrary to the city’s vision for community safety. Supporters of the ban say that violent and racist Israeli tactics not only violate Palestinian human rights, but also hurt Black and Brown communities when imported to the United States. A wave of major cities across the Spanish state express strong support for Palestinian rights. They all denounce President Donald Trump’s decision to move the US embassy to Jerusalem and slam Israel’s latest massacre of Palestinians in Gaza. Many call for an arms embargo on Israel and urge governments to ensure its implementation. The City Council of Barcelona votes for a comprehensive military embargo on Israel with the support of an overwhelming majority of its members. Ada Colau, mayor of Barcelona, tweets that the city government will ask the federal government and all political factions to stop military trade with Israel, in line with calls from Amnesty International. Valencia, a regional capital, becomes the largest city in the world to vote to become an Israeli Apartheid Free Zone and explicitly support the BDS movement for Palestinian rights. Four major Italian cities call for an arms embargo on Israel, in support of Palestinian rights. Naples and Turin join Florence and Bologna. Additionally, the City Council of San Giuliano Terme in the Pisa area not only calls for an end to arms sales to Israel, but also endorses the BDS movement. Monaghan County Council becomes the fifth Irish local authority to support the BDS movement for Palestinian rights. It follows Dublin, Derry, Donegal and Galway, and takes another step towards making Ireland an Israeli Apartheid Free Zone. Argentina’s national football team, led by Captain Lionel Messi, cancels its exhibition match with Israel. Shakira cancels her July concert in Tel Aviv, following a campaign involving Lebanese, Colombian, US, Palestinian, Israeli and other boycott activists. Dozens of bands, mostly in the UK, join the cultural boycott of Israel following Israel’s May 14, 2018 massacre in Gaza. Tiago Rodrigues, the director of Portugal’s national theater, cancels his participation in an Israeli festival and joins the cultural boycott of Israel, becoming the first director of a national theater in Europe to ever do so. The Dublin Lord Mayor and Irish Eurovision winner Charlie McGettigan call for a boycott of the 2019 Eurovision Song Contest, to be hosted by Israel, in solidarity with Palestinians. Over 25,000 Icelanders —almost 8% of the entire population—sign a petition to boycott Eurovision 2019. 11 artists and directors withdraw from Tel Aviv LGBT Film Festival. Gilberto Gil, a legendary Brazilian musician and cultural hero, cancels his July 4 performance in Tel Aviv. Jean-Luc Godard and 80 other artists in France issue a joint letter denouncing France-Israel Cultural Season 2018, a joint cultural initiative sponsored by both the French and Israeli governments. Signatories refuse to participate in events organized within this framework. The Tunisian General Labour Union adopts BDS and Tunisian civil society calls for the academic and cultural boycott of Israel on the seventh anniversary of the Revolution of Freedom and Dignity in Tunisia. Participants include prominent academics, well-known artists and important political and labor union leaders. Six artists withdraw from the Israeli embassy-sponsored Pop-Kultur music festival in Berlin. World renowned musician Brian Eno condemns this collaboration in a video interview. The UK band Shopping, singer-songwriter Richard Dawson, Welsh musician Gwenno and American artist John Maus were the first to to withdraw from this year’s festival. Two progressive Jewish groups in Germany also said they would boycott Pop-Kultur as long as it crosses the BDS picket line. Prominent cultural figures including Massive Attack, Angela Davis, Patti Smith, Danny Glover, Viggo Mortensen, Peter Gabriel and Tunde Adebimpe condemn Ruhrtriennale arts festival in Germany for initially dropping the band Young Fathers over its support for Palestinian rights. They welcome the German festival’s decision to re-invite the band and defend BDS as a lawful exercise of freedom of speech. As part of the sports boycott, over 30 Italian cities and towns protest along nearly every stage of the Giro d’Italia cycling race starting in Jerusalem. The president of the Italian Football Coaches association announces his boycott of the race. Famous American rappers Tyga and Fat Joe cancel their performances in Israel. As a result of the cancellation, the entire festival hosting them was canceled. A Thai university and research center cuts ties with Ariel University, an Israeli university built in an illegal settlement on stolen Palestinian land. British author Kamila Shamsie respects Palestinian BDS picket line and refuses to publish in Israel, citing the lack of an Israeli publisher “who is completely untangled from the state” and its violations of Palestinian rights. She is one of a growing number of authors. Amnesty International calls for an arms embargo on Israel and releases this powerful video to promote its call. It slams the United States and the European Union for their military deals with Israel and holds them responsible for “fueling mass violations” of Palestinian human rights. Human Rights Watch documents Israel’s war crimes against Palestinians in Gaza and says officials responsible should be held accountable. The group calls for “sanctions against officials implicated in ongoing serious human rights violations.” An earlier report by HRW exposes how Israeli banks bankroll and profit from illegal settlements. The European Coordination of Committees for Palestine (ECCP) reiterates its call for an immediate military embargo on Israel. The Swiss Forum for Human Rights in Israel/Palestine, a coordinating body for influential Christian and human rights groups, sends a letter to the Swiss government calling for a military embargo. 42 civil society organizations from 6 countries in Asia (Japan, South Korea, Malaysia, Thailand, India & Pakistan) call on the United Nations to publish its database of companies operating in illegal Israeli settlements built on stolen Palestinian land. In a major free speech victory litigated by the American Civil Liberties Union (ACLU), a federal court strikes down a Kansas law that sought to silence human rights defenders who boycott Israel because if its violations of Palestinian rights. The court ruled that the law is an unconstitutional denial of free speech. After being defeated in court, Kansas changes its law and no longer requires individuals paid by the state to certify that they do not boycott Israel or its illegal settlements. Defenders of free speech and Palestinian human rights win a victory in the Massachusetts legislature when a key committee refuses to advance a bill that would have prevented the state government from signing contracts with those who support an economic boycott of Israel. Major organizations from the Indian women’s movement, representing over 10 million women, endorse the BDS movement and demand the release of all Palestinian child prisoners. The Federation of Journalists’ Unions in the Spanish State and the Communications Workers Union in Ireland officially endorse the call for BDS. Black cultural figures in the United States, including Jesse Williams, Rosario Dawson, Tom Morello, Michelle Alexander, Danny Glover, Vic Mensa, Angela Davis and Talib Kweli, endorse a Dream Defenders letter that calls on all US representatives to sign H.R. 4391. The bill, which would prevent US tax dollars from supporting the Israeli military’s ongoing detention and abuse of Palestinian children, has 22 co-sponsors and counting. 40 Jewish social justice organizations across the globe recognize that the BDS movement for Palestinian rights has a proven commitment to “fighting antisemitism and all forms of racism and bigotry.” From the United States to South Africa to Canada to New Zealand to Germany, Brazil, the UK, France, Australia, Israel, the Netherlands, Belgium, Switzerland, Spain, Argentina and beyond, they condemn attempts to stifle criticism of Israeli policies and systems of injustice. The Irish National Teachers Organisation (INTO) votes to fully support the Irish Congress of Trade Union (ICTU) position on Palestine, including full support for the BDS movement for Palestinian rights. Adidas stops sponsoring the Israel Football Association (IFA), which includes teams based in illegal settlements built on stolen Palestinian land. More than 130 Palestinian sports clubs had appealed to Adidas to cancel its sponsorship deal with the IFA. French car rental giant Europcar shuts down rental facilities run by its Israeli franchisee in illegal Israeli settlements built on stolen Palestinian land. It follows a growing number of companies that have divested from Israel’s military occupation. The chief executive officer of Versarien confirms a $4 million loss due to BDS campaigning. Versarien is an engineering company that partners with Israel Aerospace Industries. A high-profile Turkish firm refuses to help build the US embassy in Jerusalem even though a partnership it is involved in won the contract for the project. A Jordanian construction company refuses to sell materials to build a gas pipeline linking Jordan with Israel. A company representative said the business refuses to work with the Israeli government. Hewlett Packard (HP) companies face $120 million in potential losses in India due to their complicity in Israel’s violations of Palestinian human rights. This comes after India’s largest, four million-strong student association, joins the BDS movement and pledges to boycott HP companies over their well-documentedcomplicity in Israel’s grave violations of Palestinian human rights. Following a successful campaign by BDS activists in Japan and around the world, Honda cancels its Israeli-government sponsored event in Israel with racing star Joe Roberts. Roberts made clear that he wouldn’t have agreed to participate in the first place if he’d known that the race was initially set to take place in an illegal Israeli settlement in occupied Palestinian territory. The Olympia Food Co-op, the first grocery store in the United States to boycott Israeli goods in support of the BDS movement, wins an important legal victory when a Washington State court dismissed an Israeli government-backed lawsuit against it. Also in New York, more than 50 New York University (NYU) student groupsendorse the BDS movement for Palestinian human rights. The student government of California State University – East Bay votes unanimously in favor of a resolution calling the university to divest from corporations that profit from the illegal military occupation of Palestine. At the University of Chile, 90% of the Philosophy and Humanities Faculty students vote to support the academic boycott of Israeli institutions and universities. Students also occupy the University’s main building to protest the ongoing Palestinian Nakba and Israel’s recent massacre in Gaza. Thirty eight student groups at the University of Cambridge in the UK call for a boycott of BAE Systems and Caterpillar over their involvement in Israeli war crimes. Another UK university, University of Manchester, ends the sales of Sabra hummus after a successful campus BDS campaign. Sabra is jointly owned by PepsiCo and Strauss Group. Strauss invests in and supports the Golani Brigade of the Israeli military, responsible for egregious violations of Palestinian human rights. These include arbitrary killings, assaults, incarcerations, evictions, arrests of children, and the use of chemical weapons such as white phosphorus. The South African Students Congress (SASCO) notes Israel’s massacre of more than 60 Palestinians in Gaza on May 14, 2018, and affirms its support for BDS and the academic boycott of Israel. It also calls on South Africa’s foreign ministry to immediately implement the governing party’s resolution for the “unconditional” downgrade of the South African embassy in Israel to a liaison office until Israel respects international law. The Union of Students in Ireland (USI), the umbrella body for student unions, votes to endorse BDS, following National University of Ireland Galway (NUIG), Galway-Mayo Institute of Technology (GMIT), Queen’s University Belfast (QUB) and Trinity College Dublin (TCD) student unions. The Episcopal Church formally adopts an investment screen to avoid profiting from Israeli human rights abuses against Palestinians. The church has more than 3 million members in the United States. Christian Peacemaker Teams International endorses a boycott of Hewlett Packard (HP) companies because of their complicity in Israel’s violations of Palestinian human rights.